A delightful 2 double bedroom 2 bathroom, Edwardian house, originally part of The Mount to which it is attached. Within easy walking distance of the River Thames and Pangbourne village with all its fine amenities, including the train station giving fast connections to London Paddington. The Gatehouse has been the subject of a tasteful and very thorough refurbishment by the present owners, creating an exclusive, beautiful and unique house within the heart of one of the most famous period Thameside villages. The renovated interior of the property has retained the best features of this period, yet incorporated the benefits of today`s modern world, including a bespoke handmade kitchen, designed and constructed by Oakley Furniture of Yattendon. The beautiful and light sitting room enjoys a double aspect with glazed French doors giving access to both the front patio and the rear patio garden. The sitting room has a pretty multi-fuel stove, with oak beam across and polished slate hearth. The original staircase winds gently from the inner hall to the first floor landing which has two large windows flooding this area with light. A useful study area will be found on this large landing and both the bedrooms are doubles; bedroom 1 fitted with a fabulous ornamental Victorian fireplace and a spacious modern ensuite. Bedroom 2 has an original Victorian fireplace and a modern, recently fitted bathroom lies adjacent. The rear patio enjoys the sun from the south and is a natural sun trap, with lots of room for summer dining, BBQs, etc. See note 1. This is a very peaceful and sleepy part of Whitchurch village, with easy walking distance to open countryside, footpaths and bridle paths. The Gatehouse offers a fine opportunity to acquire a very special village residence within a special village. It can be suitable as a primary residence, or due to its great security, a fantastic second home or UK base. ● Kitchen has fitted washer/dryer, butlers sink, granite work surfaces. See note 2. Summary of accommodation: Sitting room, kitchen, inner hall, cloakroom, 2 double bedrooms, ensuite shower room to bedroom 1, adjacent bathroom to bedroom 2, rear south facing patio, further secluded patio to the front, parking on street, single garage within a separate block a couple of minutes walking distance. Local facilities: The Gatehouse is within easy walking distance of Pangbourne village centre with its fine selection of award winning independent shops, a small supermarket, health centre, dentists, library, hairdressers, riverside pubs and fine restaurants. Pangbourne offers superb transport links with a fast train service to London Paddington, Oxford and Reading, the imminent Crossrail offering fast links to the City in the coming years, as well as buses to all local areas. Whitchurch-on-Thames also has two fine village pubs in The Greyhound and The Ferryboat. The River Thames is close by with the river meadows, part-owned by the National Trust and a footpath giving fabulous Thameside walks. A short drive away is Beale Wildlife Park & Gardens and Basildon Park, a National Trust property featuring a splendid Georgian mansion surrounded by 400 acres of parkland. Excellent schools: Whitchurch-on-Thames is located within easy reach of a number of fine schools. Pangbourne College, Bradfield College and St Andrew`s Preparatory School are within easy driving distance, as are The Oratory School, Downe House, Cranford House and Moulsford Preparatory School. 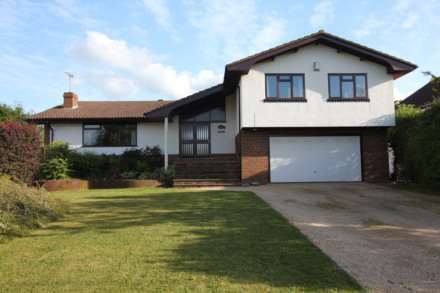 The property is in the catchment area of Langtree Secondary School at Woodcote, and Whitchurch Primary School which has an outstanding record. Directions: From the offices of Singleton & Daughter turn left, left again at the mini roundabout and left again at the mini roundabout at The George Hotel. Proceed over the River Thames toll bridge and along the High Street. Turn right opposite the art gallery into Hardwick Road. The Gatehouse will be found just past the entrance to The Mount, on the right hand side. Note 1: Planning permission has been applied for and is expected to be granted for an extension into the rear patio forming a further reception room. Services: Mains electricity, gas, water and drainage. Tenure: House is Freehold. Garage is Leasehold for 99 years from 1966 at a fee of £2 per annum. E-mail: info@singletonanddaughter.co.uk London Office: Cashel House, 15 Thayer Street, London, W1. IMPORTANT NOTICE: Dudley Singleton & Daughter for themselves and for the vendors of this property, whose agents they are, give notice that: 1. The particulars are intended to give a fair and substantially correct overall description for the guidance of intending purchasers, and do not constitute part of an offer or contract. No responsibility is assumed for the accuracy of individual items. We relied upon our own brief inspection and information supplied to us by the vendors. (i) The description, including photographs of the property and its contents, are intended to be a guide only rather than a detailed and accurate report and inventory. (ii) Floor plans, measurements, areas and distances are intended to be approximately only. (iii) Prospective purchasers are strongly advised to check measurements. The position of bathroom fittings as shown on the plan is indicative only – sizes, shapes and the exact locations may differ. Wall thicknesses, together with window and door sizes are approximate only and window and door openings are shown without frame details. (iv) Photographs are not necessarily comprehensive or current and no assumption should be made that any contents shown in them are included in the sale. 2. All descriptions, dimensions, references to condition and necessary permission for use and occupation and other details are given in good faith, and are believed to be correct, but any intending purchasers should not rely on them as statements or representations of fact but must satisfy themselves by inspection or otherwise as to the correctness of each of them: 3. No person in the employment of Dudley Singleton & Daughter has any authority to make or give any representation or warranty whatever in relation to this property or these particulars, nor to enter into any contract relating to the property on behalf of the Vendor. 4. No responsibility can be accepted for any expenses incurred by intending purchasers in inspecting properties which have been sold, let or withdrawn.